Computers are a crucial part of today’s life. Be it for use in the office or at home, everyone needs a computer today. Computers are used for different purposes, including listening to music and podcasts, gaming, video conferencing, and watching movies. Such uses require high-quality sound. While computers come with inbuilt speakers, be it a laptop or desktop, the speakers are usually weak. Some of them are almost inaudible due to poor quality. Thus, they never deliver quality sound. Luckily, you’ve the freedom to improve the kind of sound you get from your computer by adding high-quality PC speakers. While some people prefer using headsets, they’re not comparable to speakers. 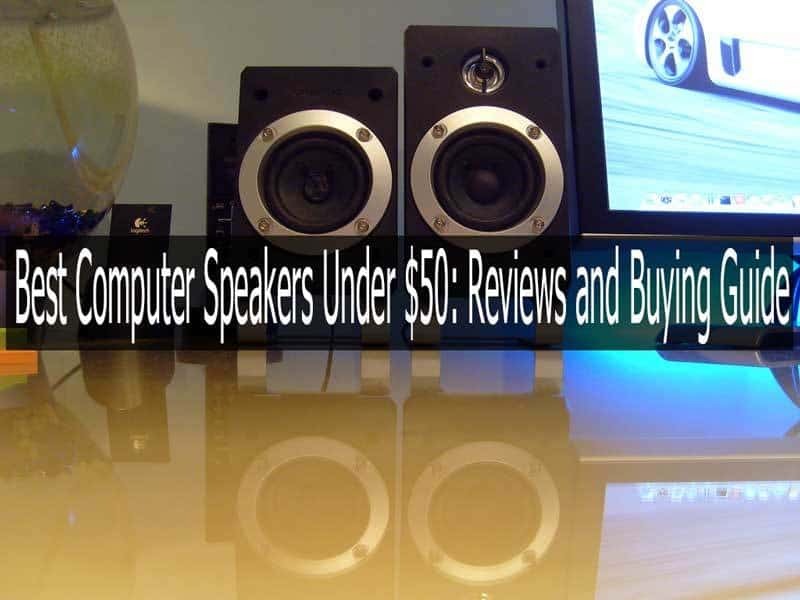 With that said, here’s a detailed review of the best computer speakers under $50. Cyber Acoustics is made to make you feel quality sound from your computer. It comprises of two satellite speakers and a flat panel sub that delivers deep bass. This makes it a 2.1 channel speaker set for the best music tone. It employs high-power amp and low-distortion technologies for high volume with clarity. Here’re its hits and misses. ​Rich sound- Cyber Acoustics features a 5.25 inches subwoofer and two drivers. Their combined effort delivers clean and crystal clear sound, with the best lows, midrange, and highs. ​Stylish design- The set of speakers are housed in a wooden cabinet. They are stylish and designed to blend with the look of today’s flat-screen monitors. ​Convenient controls- These speakers come with a control pod for enhanced convenience. The control pod offers full control such that you can easily control the volume and bass to your liking. ​Inbuilt power supply- The speakers come with an internal power supply in the subwoofer. Thus, you’ll not have to use an amp since it has its own power for room-filling audio. ​AUX input- What could be better than connecting your mobile devices to a laptop or desktop speaker? Cyber Acoustics come with an AUX port where you can connect your MP3 player or smartphone for more sound. Our Verdict: ​Cyber Acoustics is an affordable set of speakers suitable for gaming lovers and occasional movies and music. They produce amazing sound, look stylish and suitable for smaller rooms. This set of 2.1 channel speakers offers great power, enough for an office or small to medium rooms. They are designed to offer 360 degrees sound. Thus, whether you’re in front or at the back of the speakers, you’ll enjoy high-quality sound. Read on for a detailed review. ​Dedicated buttons- The right speaker comes with a knob for controlling the volume while the sub has a bass knob. This, you’ll have the freedom to control the overall volume and bass. ​Dual RCA inputs- The right speaker features two 3.5mm input ports while the sub comes with two RCA inputs. You can connect a headphone on one port and an aux device on the other port. ​Easy to set up- Each speaker has a connecting cable with a right and left connector. The connectors are plugged into the subwoofer and with that, you’re set to start using the speakers. ​360 degrees sound- Each satellite speaker features a tweeter at the front and another at the back. This allows for enough sound throughout the space regardless of where you may be seated. ​Ported subwoofer- The ported 4-inch sub features a dome driver for enhanced bass. The subwoofer design optimizes modern technologies for rich bass. Our Verdict: ​Logitech will obviously add more sound to your personal computer. The quality of sound it offers is good enough for most users. It’s especially ideal for listeners who prefer more bass over midrange and treble. ​TaoTronics is specially designed for portability. Its compact size makes it easier to carry than its competitors. You can easily carry it to your office from home. Thus, wherever you go, you’ll never miss listening to your favorite tracks and tutorials. Let’s look at its hits and misses. ​Support for a microphone- You’ll be amazed to know that you can actually use a microphone with TaoTronics. Simply plug the speaker cable into the 3.5mm microphone port on your PC and enjoy some karaoke. ​Slim design- This speaker is extremely slim in design. It takes little desk space, making it ideal for the smallest desk spaces. ​Portable- The speaker is USB powered, compact and small size. As such, you can easily carry it while on the move to play music from your portable devices and power it with a power bank. ​LED accents- The volume knob features LED accents. The LED accents create a perfect ambience for listening to music and watching movies. Our Verdict: TaoTronics is specially designed to fit the smallest spaces. If your desktop space is limited, then this speaker is made for you. It’s also ideal for users who prefer more midrange and treble over bass. ​USB powered- The speakers are powered from a single USB connection. You simply need to plug in the USB cable into a USB port and start using the speakers. ​Shared cable- The two speakers share the same speaker cable. You’ll just connect one speaker cable to a 3.5mm port on your PC and they share the cable from the other end, thereby minimizing the amount of cabling needed. ​Sound balancing technology- Altec desktop speakers feature audio alignment technology for sound balancing. This allows for enhanced quality of audio regardless of the genre you’re playing. ​Small size and compact- The speakers are cylindrical in shape and small size. They’re designed to take minimum space on your desk and you can easily carry them with you. ​Magnetic shielding- Most speakers interfere with the monitor display when placed close to the monitor. Luckily, Altec speakers come with magnetic shielding technology, such that they don’t interfere with the monitor display. Our Verdict: ​This speaker is specially designed for anyone with limited desk space and anyone who wants a speaker they can carry along with their laptop. If you’re such a person, consider this speaker right away. ​Deep bass- The subwoofer features an inbuilt amplifier and 15 watts RMS. It delivers rich bass for the best effects when gaming and watching movies. ​All-round audio- Besides the subwoofer, Genius Gaming also features 2 satellite speakers for all-round audio. The 2.1 channel support allows listeners to hear all sound notes, whether high, low or midrange. ​Wide compatibility- You can use this speaker with a Windows or Mac PC and mobile devices such as tablets, MP3 players, DVD players, gaming consoles, smartphone, Smart TV, and more. You only need to plug the speaker cable to a device with a 3.5mm input. ​Easy to set up- You only need to connect the speaker to your device and power it with AC and you’re set to use it. Setting it up is simply plug and play. ​Responsive controls- You can easily control the volume using the volume knob and adjust the bass using the bass knob. These knobs are responsive and convenient to adjust the volume or bass to your liking. Our Verdict: ​Looking for a set of speakers for your computer that can deliver all-round sound? Genius Gaming is your best bet. In case you’re a gaming enthusiast, these speakers might be what you’re looking for. ​In-line volume button- The speaker cable features an in-line volume button. This kind of control is especially important when you can’t access the volume control on your PC. ​Portable- The dual speakers are small size and compact. You can easily carry them wherever you go. ​USB powered- You’ll not have to use AC to power these speakers. You’ll simply plug the USB cable in your PC for power. ​LED lighting- The base of the speakers is decorated with soft LED lighting. The lighting creates great ambience when using the speakers. ​Sleek design- These speakers stand out for their sleek finish and design. They make any computer desk standout. Our Verdict: ​These speakers are ideal for users who need PC speakers for listening to audio without much need for bass. They’re also a great choice for anyone who loves portable speakers. ​Simple structure with a strong build- The speakers are made of high-quality metal and plastic. The build is strong and well finished. ​Inbuilt bass diaphragm- The bass diaphragm adds bass to the sound produced by these speakers. This allows for high-quality lows. ​Rounded base- The base of the speakers is rounded in shape. This makes them more stable such that they can’t tip over the desk easily. ​Acoustic resonator structure- This pair of speakers stand out for their acoustic resonator structure. This structure design delivers all-round and more penetrating audio. ​Wide applicability- The speakers come with a 3.5mm speaker cable. Thus, besides using them with your PC, you can attach any other device with a 3.5mm audio-out port. Our Verdict: ​Sanyun performs great for audio needs that don’t emphasize on bass such as dialogues, podcasts, video conferencing, and more. They’re also ideal for users who like listening to music while on the go due to their portability. Just like the name suggests, Creative speaker system is indeed creative. This speaker system offers versatile sound for gaming, movies, and music. With this speaker, you’ll enjoy full-range sound from any PC or device with a 3.5mm audio-out port. Let’s see why Creative A250 is worth your consideration. ​Image focusing plate- The speaker features IFP technology. This sound technology enhances the overall sound quality. ​Dual slot enclosure- The subwoofer features dual slot enclosure technology. This technology improves the bass response while adding to the loudness. ​Full-range sound- With this speaker, you’ll enjoy lows, midrange, and highs. You’ll not miss any tone. ​Durable and high quality build- The body of this speaker system is made of a strong material. The material enhances its durability. ​Convenient buttons- The speaker set comes with convenient volume and power buttons. This allows for easier volume adjustment and convenient switching on and off. Our Verdict: ​Looking for full-range speakers for your PC? Creative A250 is ideal for any kind of application, be it gaming, music, podcasts or any other purpose. Thus, this speaker set has what it takes for your consideration. ​Aluminum alloy body- The speakers come with an aluminum alloy enclosure. This enclosure makes the speakers look sleek. ​Dual drivers- Each speaker features dual drivers and a bass woofer. This allows for full range sound, regardless of the genre. ​LED lighting- The base of each speaker comes with LED lights. The lights have an on and off switch for convenience. ​Vertical standing design- The speakers have a standing, bar design. This way, they take minimal space on your work desk. ​USB powered- The passive woofer drivers and speakers are powered via USB. Thus, you can carry them with you when on the move. Our Verdict: ​GoGrooveis designed for modest use, where bass-intensive use is not a priority. With its dual-drivers and passive woofers, you’ll still get full-range sound. ​Headphone jack- The speaker comes with a headphone port. Thus, you can attach your headphones whenever you don’t want to distract other people, especially in the office. ​Extremely portable- The speaker does not need any batteries or AC. You simply plug it in your PC USB port for power. ​Low-profile design- You can hardly notice this computer bar speaker. It’s designed to fit even the smallest desk spaces such that it won’t take much space on your desk. ​Rich sound- Despite being small in size, you’ll be amazed by the kind of sound it delivers. It delivers high-quality stereo sound. ​Responsive volume control- This computer sound bar has an integrated volume control knob. The knob is extremely responsive and makes it easy to adjust volume. Our Verdict: ​If you’re looking for a PC speaker that is extremely small but delivers clear stereo sound, consider Dell AC511. It’s hardly noticeable and will never bother you about space. The electronics market today has dozens of speakers designed for computers, be it laptops or desktops. Thus, it’s a bit hectic to make a choice, especially when you don’t know where to start. There’re certain things you should know about these speakers before buying one. Speakers come in different sizes and shapes. The kind of shape to choose should depend more on your personal preference. Some have a satellite design while others are rounded, cylindrical or box-shaped. If you have limited space on your computer desk, you would rather go for satellite speakers or compact cylindrical options. In case your desk space is not an issue, you can go for larger box-shaped and rounded speakers. ​In case you’re always on the move with your PC, you would want speakers that you can carry along. Thus, you should go for portable speakers for your computer. Such speakers should be lightweight such that you’ll not struggle to carry it in your bag. Also, it should be compact and small in size to fit in your travel bag without the need to get an extra, special bag for it. When it comes to portability, the source of power matters a lot. Thus, you should consider a type powered by USB. This way, you’ll simply power it with your laptop or even a power bank. This way, you can use it just anywhere. Different devices have different types of inputs. While most computers have a standard 3.5mm jack for plugging these speakers, you might want to attach them to other devices. For instance, you may want to use them with your gaming console, TV or DVD. Thus, ensure it has inputs such as 3.5mm and RCA. If you like using headphones, then consider speakers that have a 3.5mm port to plug in your headset. Choosing a type with more inputs will allow you to connect unlimited types of devices. It’s always great to have a device that gives you the freedom to control it as you like. For instance, you should choose a type that has volume control. This way, you’ll not have to rely on the computer volume controls. Sometimes, software misbehaves and it’ll help to control the volume from the speaker itself. Also, you would want to control the bass and tone. Thus, consider a type with a bass button especially when bass matters a lot to you. Speakers that can be attached to PCs come in different channels. Some have a single channel while others have 2.0 and 2.1 channels. Here, your preference should depend on the kind of sound you want. In case you just want to listen to basic dialogue and conversations, a 1.0 or 2.0 channel will suffice. In case you want to listen to music or watch movies without much emphasis on bass, a 2.0 channel will also work for you. A single channel option comes with a single speaker while a 2.0 channel option features two speakers. However, if you love watching movies and listening to music with more bass, or you love gaming, then you should consider a 2.1 channel option. A 2.1 channel option comes with two speakers and a subwoofer for more bass. Thus, base your choice on your sound needs. Since most PCs hardly deliver high-quality and loud audio, PC speakers come in handy as an ideal solution to this problem. These speakers come in different sizes, types.and features. As you can see, they have their own benefits, shortcomings, and differences. Your choice should be based on the kind of sound you need. Thus, from these options reviewed, choose the option that has the features you need. While cost matters, never choose based on cost alone. The cheapest option is not always the best and similarly, the most expensive option doesn’t mean it’s the best. Although your budget will surely have an impact on your choice, remember quality comes first.